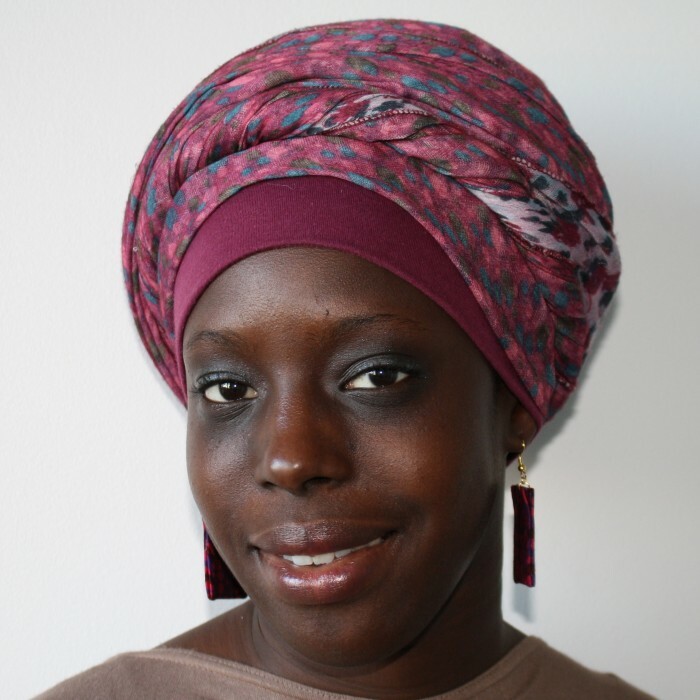 My name is Fatoumata Kebe, I’m 29 years old and I’m in the final year of a PhD in astronomy. I work on space debris. It is the traces of human activity in space, all the things we have left there. Bits of rockets, for instance. My work focuses particularly on what happens when these objects collide and explode. For example, I try to determine how many pieces of debris an object will split into. What made you want to work on this subject? A while back, I went off to take part in a programme at NASA. Over there, I took a space environment course on the subject with an engineer from the European Space Agency. I liked it because, at the time, I was torn between space and the environment, and here was a subject that dealt with the environment in space. Perfect! Is it the profession of the future? I hope so! We leave traces everywhere we go: there is plenty of work to do. 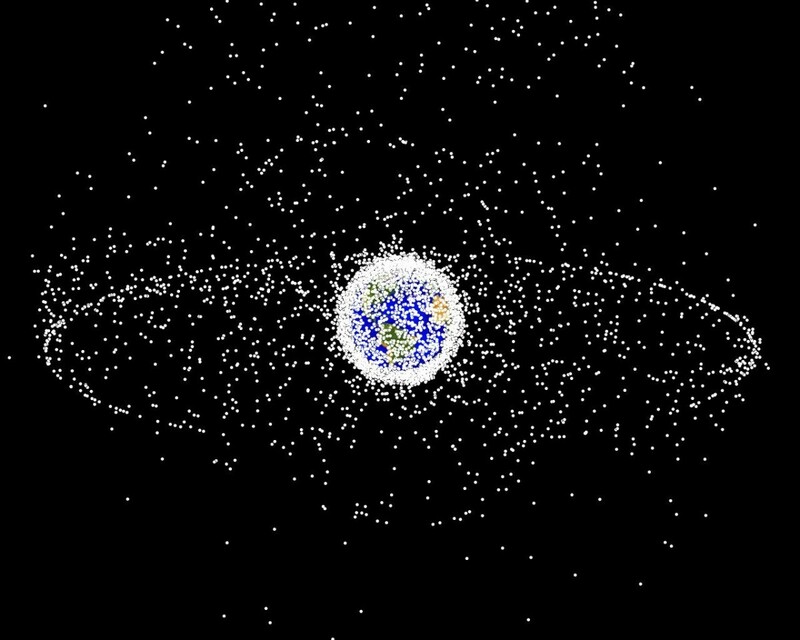 There are currently two million pieces of debris orbiting the Earth. The best known are probably the objects man left behind on the Moon. Some people see those things as debris. NASA calls them “space archaeology”. So how do we determine what is space archaeology and what is pollution? It’s politics. People tend to draw the line wherever it suits them. When a country sends an object into space, it is supposed to register it with a UN department that handles these matters. There are only 4000-5000 objects registered in the database, but it became clear from observing the sky that there are at least four times as many objects up there originating from Earth. Basically, states sign conventions and then do not adhere to them. As an astronomer in the making, do you look at the stars on a day-to-day basis? Astronomers are doing less and less of that these days. I do it to learn about astronomy, but not directly for my work – it’s mainly calculations done on a computer. You are not quite an astronomer yet, but you have already received quite a lot of media attention. Can you explain why? It all started with a video I was in for We Talk, an event which gets women to talk about their lives and careers, with a different theme each year. The year I was involved, the theme was “Don’t make other people’s limitations your own”. In my case, those limitations were the limitations imposed by my teachers and the people who would say to me, “you’re not cut out for that”. Then there is the Space Women exhibition which is on at the moment. They put my face on the poster! There are 90 portraits of women. Three or four of them are French, and of those I’m the only one based in the Paris region, so I’m the one who talks to the media the most. I realised, after seeing some of the feedback, that everybody suddenly wanted a piece of me. I tick a lot of boxes. I’m a girl, I’m black, I’m from the 93 [Seine Saint-Denis, the notoriously underprivileged département immediately north-east of Paris], I’m of Malian descent… All this was mentioned every time. A recent article referred to me as a “Franco-Malian astronomer”, when I’m actually French and I didn’t mention my nationality in the interview. In the We Talk video, I make a joke about being a space cleaning lady. Now, that’s how I’m defined in the media, when it was actually just a joke in the video. At one point in my speech, I say that my mother is a cleaning lady, and then I say, for a laugh: “Come to think of it, I’m a cleaning lady too, but in space,” and then I add: “It’s a bit of a step up, though. There’s obviously an upward curve between Earth and space!“. I didn’t know how journalism and communication worked, how they could take one little remark and use it to define you, just like that, whether you like it or not. Another thing I didn’t really appreciate was people writing that I was from a “modest family”. If the girl had been white, would they have written that? I don’t know. Do you think so? I don’t know either. But I do know that one day someone wrote an article about me and another girl who was in astrophysics too. For her, they used the title “Explorer of the universe”; for me, they put “Astronomy’s black star”. That article talked about my “modest family” and the fact I’m from the 93, and barely mentioned my work. There’s a paradox there, because, as you say, you wanted to speak out against clichés, and yet you find yourself subjected to them anyway. Do you feel like you’ve fallen into your own trap? What I object to is being presented as a good story, and particularly as a unique story. There are other people like me! People just don’t know about them. They aren’t given any attention. How would you like people to talk about you? I want people to talk about my work! Let’s talk about it, then. What is your goal with regard to space debris? Half of the space debris created today is created either by a collision or by an explosion. 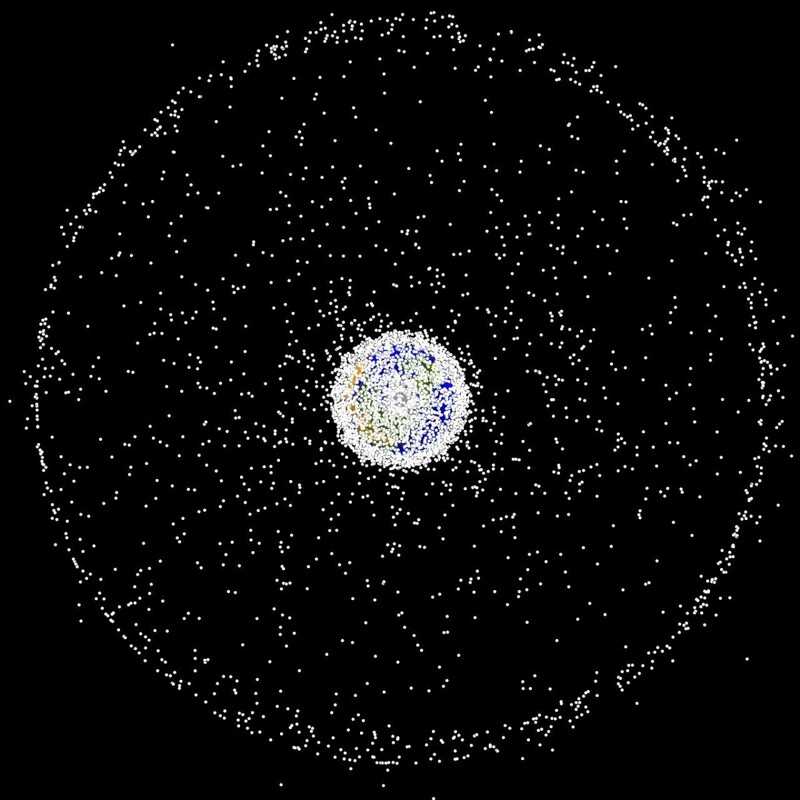 Today, the natural reaction is to say that even if we were to stop sending objects into space, the number of pieces of debris would never stop increasing. A 5 cm piece of debris in space has about as much energy as a bus. And it can have very serious consequences. It only takes a collision with the fuel tank of a satellite, for example, for the situation to become critical. Not like that. But accidents do happen. Satellites do disappear… It’s astronomers who notice, because countries rarely admit that these things have occurred. As a country, you are responsible for your satellite, even if it’s old. So for them, it’s easier to hush it up. Are there conventions? International agreements? There is convergence in some areas, at European level, for instance. But countries do things at their own pace. In any case, one country cannot do it all by itself. There are countries where there’s nothing at all, and others where progress is being made. France has established a space policy. But that was very costly, so countries are generally quite tentative about these things. What is the big challenge for you at your level? We’re going to have to clean up space. We need to find a method for cleaning it. That’s what I’m working on. The space around the Earth is too cluttered. 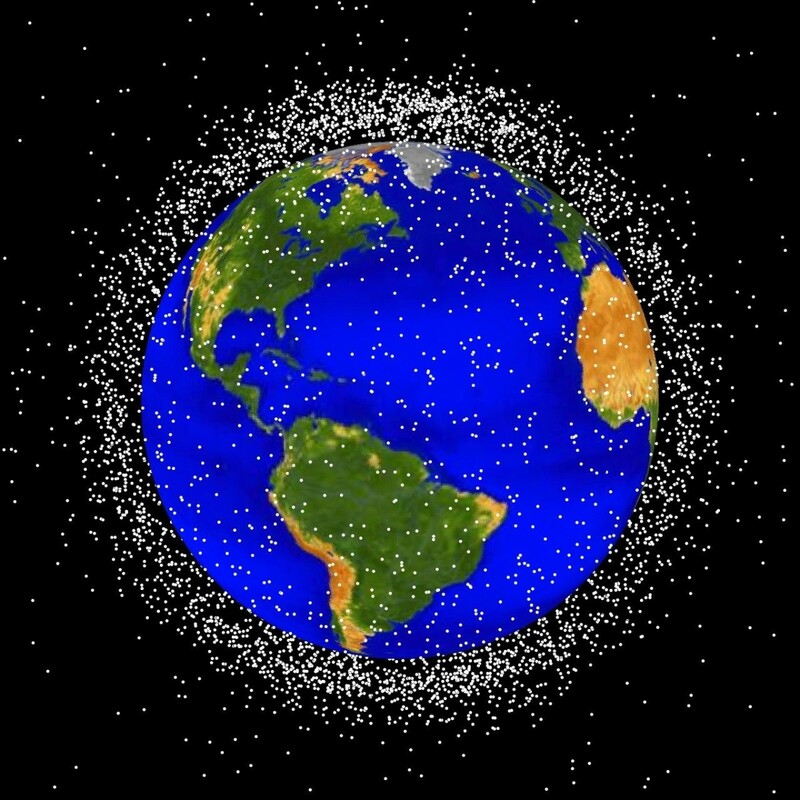 We can’t send up any more rockets or satellites without risking their being destroyed by debris. And when might that start to become dangerous? NASA’s estimate is 2025. Given that everything takes such a long time to set up in space, that doesn’t leave us much time at all. There are companies that have already started working on it, including a Singaporean firm, Astroscale, which says that it will soon launch a space vacuum cleaner. Everyone is working on their own method. You are one of the women featured in the “Space Girls” exhibition that is running at the moment. Could you tell me a bit about it? It’s an exhibition of 90 portraits of women from all over the world. There are video interviews with 18 of them. The photography agency Sipa is behind the project. Women don’t usually see it. We account for barely 17% of people working in space-related fields. Sometimes I set high-school students the challenge of naming a woman who works in space. They can never do it. Even in the media, when experts are invited to talk about astronomy, they are always men… I have rarely seen women talking about astronomy in the media. 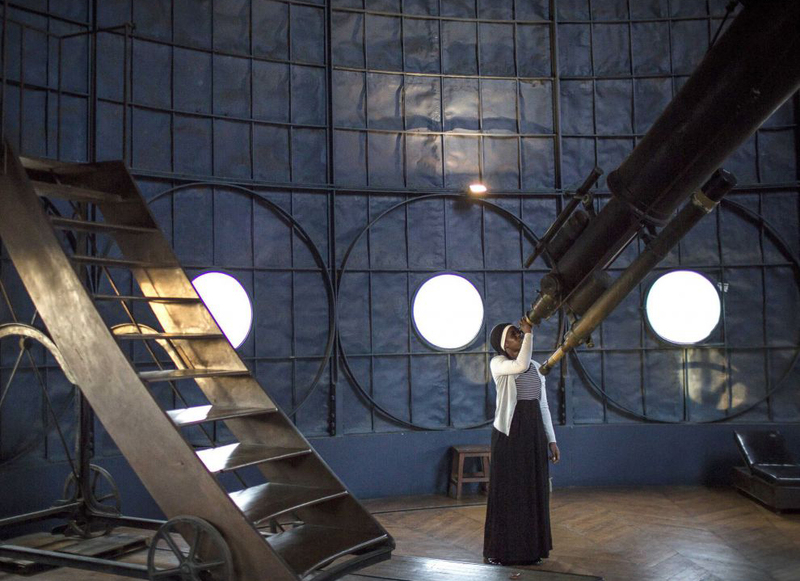 How can we make people’s perception of astronomy and space-related professions less “male”? I think the problem is a wider one. There is a problem with women in the sciences, from high school onwards. Once you get to university, the numbers of women dwindle over time. There are very few of us left by the time you get to post-doctoral level. So why did you carry on? Because I’m stubborn. I’m carrying on. I’m going as far as I can. As far as jobs are concerned, we’ll see what happens… It’s true that it’s a long process. A lot of girls around me have said things like “Fatou, I want a family life”. Girls lack self-belief in this field. Do you feel you’ve been discouraged? People have tried to discourage me, yes. People would say to me, “It’s too hard. Stop. Maybe you should take a break. Your emotions are playing tricks on you. You’re not going to be able to handle all this pressure”, etc. The kind of things girls say. And then, when you answer the telephone and you’re with a male colleague, people always think you’re the secretary. 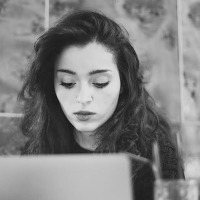 Nothing is being done to make women feel supported and encourage them to stay in the field. What kind of measures could be taken in that regard? I’m against positive discrimination, so it’s quite difficult. I think there’s a lot of work to do with girls in general. It’s a deep-seated problem. I have had people say to me: “You’re not a real girl; you work in space”. That proves that mentalities need changing, from school onwards. Speaking of which, you founded an association, L’Éphéméride, last year. You go into schools. What do you do there? I had had schools call me to go and speak to their students. The questions those students asked gave me the idea to create the association. They would always say to me, “Wow! You’re an astronomer! That’s crazy!”. I wanted to say to them: astronomy makes your eyes light up. I’m not saying it’s not difficult, but you can do it if you work hard enough. So I said to myself, “I’m going to give them astronomy lessons. They’ll see that they can do it, and when they see that they can do it, maybe that will give them the confidence to go into other fields”. We take them on visits to the Paris Observatory, where I work, and get them to play around with the instruments. The idea is to continue that and, in time, to do it on a bigger scale if possible.